The application of nanoparticles in the field of science, technology, and medicine inspired the development of ultrasensitive techniques for real-time detection. Interferometry is a promising technique for nanoparticle detection. However, existing studies assume spherically shaped nanoparticles only. We present a scheme to detect an ellipsoid nanoparticle by measuring the Rayleigh scattered field. Variation in the geometry of the nanoparticle affects the signal value.It shows dependence on the volume, and on the ratio of the semi-axes (ρ = ax/ay, ay = az). A spherical nanoparticle was used as reference for verification. Additionally, a differential detector limits the effect of the signals that did not interact with the scattered light to produce a signal affected by the interferometric term only. M. A. Julian, J. H. Leal, R. M. Siose, Z. M. Bermejo, A. N. Chua, and R. Simon. 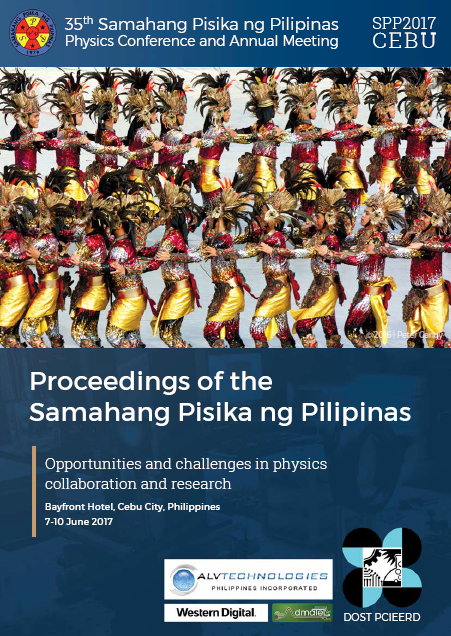 In silico measurement of light scattered by ellipsoid nanoparticles, Proceedings of the Samahang Pisika ng Pilipinas 35, SPP-2017-PA-26 (2017). URL: https://paperview.spp-online.org/proceedings/article/view/220.